This stout fish has a special organ just behind its eyes that produces an electric shock which it uses defensively, so caution is advised when handling. It has completely adapted to spending most of its life buried in sand, waiting to ambush its prey and gulp it down whole. The eyes, gill slits, nostrils and most of its mouth are on the top of its body, and its pectoral fins are adept at digging and burying. 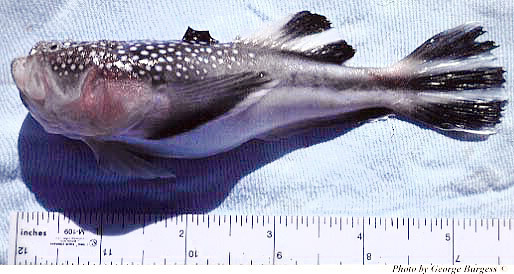 It is a dark blackish-brown with white spots on head and body, and striped fins, and it can grow to almost 22 inches long. Northern stargazer (English), aranhuco (Portuguese), bezmek (Serbian), cabecudo (Portuguese), kurbaga baligi (Turkish), lychnos (Greek), pesce prete (Italian), rata (Spanish), skaber amerykanski (Polish), sterngucker (German), stjarnkikare (Swedish), and taivaantahystaja (Finnish). Because of the stargazer’s ability to produce electrical currents, live specimens of this species should be handled with care. If approached by a diver, it generally will not move unless disturbed. The northern stargazer is not listed as endangered or vulnerable with the World Conservation Union (IUCN). The IUCN is a global union of states, governmental agencies, and non-governmental organizations in a partnership that assesses the conservation status of species. 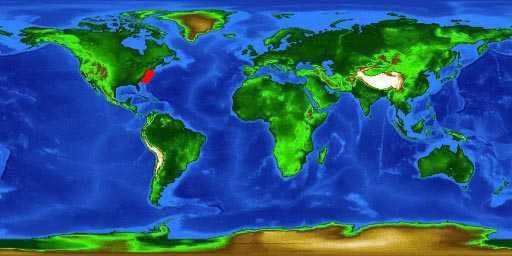 It inhabits sandy bottoms of the temperate waters of the western Atlantic, ranging from North Carolina to New York. The northern stargazer, Astroscopus guttatus, is a benthic species, living most of its life on or under the bottom. 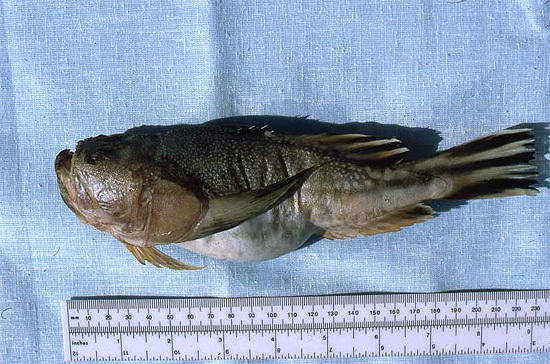 It is found inshore, at depths to 120 feet (36 m). The northern stargazer is well adapted to life under the sand. The body is moderately elongate. Its pectoral fins act as shovels, enabling the fish to bury itself in a matter of seconds. The eyes and nostrils are strategically located on the top of the head so that they will remain above the sand when the fish is buried. Unlike most species of fish that bring water in through their mouths to breathe, the stargazer breathes through its nostrils. The nostrils are protected from sand grains by fleshy, comb-shaped fringes. The mouth also has these fringes around it to keep sand out while the fish is buried. The eyes are capable of protruding for a short distance, appearing stalked, for a limited amount of time to allow the fish to gaze over the bottom. The stargazer does this by filling the tissues behind the eyes with liquid. The gill slit is narrow and drawn backwards and upwards into a short, baggy tube. This tube carries waste water away from the fish and outside the surrounding sand. This fish possesses a special talent: it is able to create weak electrical currents from a specialized organ located behind the eyes. The blackish-brown body is covered with white spots that gradually increase in size towards the rear of the body. Top of head and body has small, closely spaced white dots. There are three dark, horizontal stripes on the tail. The southern stargazer, Astroscopus y-graecum, closely resembles the northern stargazer in appearance and in life history. An easy way to tell these two species apart is to note the middle stripe on the tail. On the northern stargazer, this stripe extends onto the rear portion of the body; on the southern stargazer this stripe does not extend pass the tail. Adults may reach 22 inches (56 cm) in length, but are more common at lengths of 8-18 inches (20-46 cm). 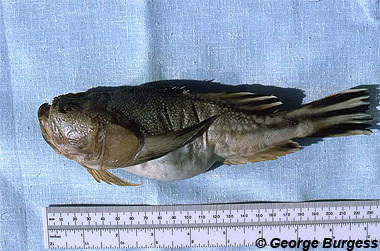 The diet of the northern stargazer consists of smaller fish that are unlucky enough to swim near it. The electrical organ is not used to capture prey. Its main function is to protect the stargazer from anything that may pose a threat to the well being of the fish. The stargazer instead relies on its camouflage and lies in wait for a small fish to swim near it. Once the prey is in range, the stargazer rises from the sand and in an instant swallows the fish whole. True to its benthic nature, the northern stargazer spawns on the bottom during the late spring and early summer months. The eggs are small, transparent, and slowly float to the surface. These eggs hatch into small, transparent larvae that live in the water column. These pelagic larvae grow rapidly, feeding off the yolk sac until they reach about 6-7 mm in length. When they reach this length, the yolk sack has been completely consumed and the larvae begin feeding on other larvae in the water column, including some of their own kind. They also begin to acquire a black color that deepens with time. As they grow, a bright yellow spot appears on the chin. The electric organs begin to form when the larvae reach about 12-15 mm in length. At this length the larvae will migrate to the bottom and become a true juvenile. Juvenile stargazers tend to move inshore to sandy bays, where they may stay for several years. The juveniles will develop the characteristic patterns of the adults during the time spent in the sandy bays. The eyes, which were on the side of the larval head, will also migrate to the top of the head. When the juveniles reach about a foot in length, they move offshore and become adults.